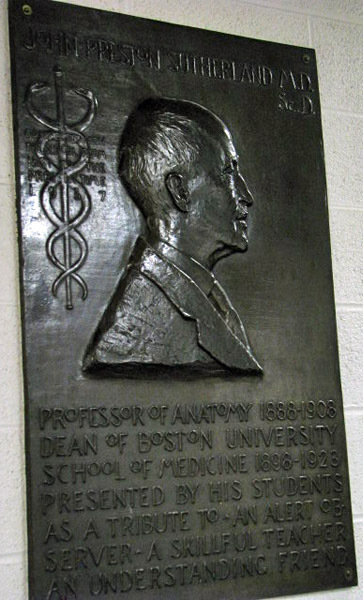 A bronze bas-relief portrait to honor Dr. John Preston Sutherland was presented the the Boston University School of Medicine by his students in the Evans Memorial Auditorium in the Fall of 1937. The sculptor, it was announced, was Frederick W. Allen. Boston University opened its first medical school (homeopathic) on November 5, 1873. By 1899, Dr. Sutherland had assumed the role of Dean of the School of Medicine, a position he held until 1923 at which time he was honored with the title of Dean Emeritus. He continued to serve in that capacity as well as taking the role of Professor of Medicine until his death in February 1942. He had served at the school for forty-three years, twenty-three of which were as Dean. Dean Sutherland was a live subject for Frederick Allen. Often portraits were made using only photographs and personal descriptions, perhaps a death masque. Having come to know him, Allen was able to capture the Dean’s spirit in his portrait. How they knew one another is unknown since Allen had ceased keeping a diary by then, but there are other connections within Boston’s medical and artistic communities. In his career as a young man he had worked for Dr. Weld at Harvard Medical School making and coloring wax models of diseased body parts for the dermatology students. He portrayed Abraham Shuman, the philanthropist for Boston City Hospital. Other doctors are named in his list of work. By 1937, Allen’s reputation had grown in Boston’s art world and he was sought after for his ability to create likenesses. He can be compared in this portion of his “oeuvre” to St. Gaudens, called the greatest American sculptor, who was famous for his portrait work. One can see his direct influence on Allen who learned from Bela Pratt who learned from St. Gaudens. The direct legacy of master to student is evident. Looking at the details of the portrait, kindness is evident in the good doctor’s face. There are lots of textural details and realistic elements to note, reminiscent of St. Gaudens. His coat looks as if it is made of a tweed material. The lapel is lifted up away from the chest. The tie has flat planes showing the light against the folds of silk. His mustache is curly and thick, but trimmed. The hair is artfully done, concealing/revealing a comb-forward style and a thin covering. The skin looks a little ruddy but the face is gentle and intelligent. 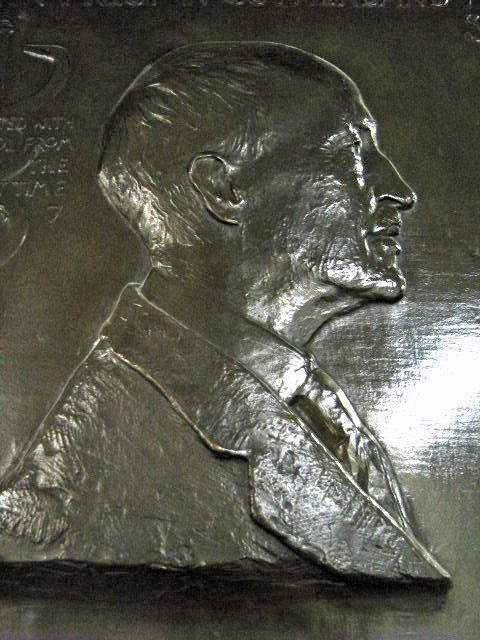 A symbol and lettering were often used in St.Gaudens and Pratt’s bas relief work. The tradition was continued by Allen.